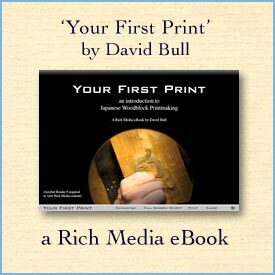 I'm so happy to see my great-uncle Frank's book on woodblock printing available on the internet. He died long before I was born, but one of my uncles who was living in California at the time cared for him in his old age and has many fond stories of him. Frank Morley-Fletcher was a distinguished artist and teacher in his day, but he died destitute and few people today have heard of him. But what was more interesting was that Alan also put me in contact with Mr. Norman Frank Best, the uncle he mentioned in the email message. Mr. Best turned out to be living on Saltspring Island in British Columbia Canada, and although he was a bit hard of hearing (he is 87), was quite happy to talk to me about his recollections of Mr. Morley-Fletcher. When I first called him he was busy with guests and asked me to call again; I did so a few weeks later, and recorded the conversation, which I have his permission to include here on this web site. It is just about 20 minutes in length (in .mp3 format), and if you have enjoyed reading Mr. Morley-Fletcher's book, listening to this conversation will give you some sense of what kind of man he was. Thank you very much to Alan and his uncle for sharing this with us. Just letting you know my Uncle Norman Best, whose recorded voice you feature on your website, died peacefully on 5th January 2004, just eleven days short of his 92nd birthday. Frank was my grandfather's uncle. I would love to be able to hear this interivew, and i'm sure my grandfaather would love it also. is there any way to update the audio, or have a copy sent to my email address. The audio file here is indeed in need of updating ... the RealAudio format is pretty much obsolete ... I don't have time just now, but I'll put this on the 'to do' list; I'll let you know when I get an .mp3 version uploaded ... Thanks for your patience!